Allows student to include courses from other disciplines in a flexible, mentor-advised major. Philosophy as a discipline has always been devoted to debate and conversation. The philosophy faculty here at EIU — which currently includes nine professors representing all of the major branches of both Western and Eastern philosophy — is devoted to continuing this fascinating conversation. Philosophy at EIU has a distinctive sense of community. Our physical space welcomes students, offers refreshments and opportunities to engage with faculty at almost every hour of the day. Faculty are not stuffed away in their offices, they are in the main office, chatting, snacking, sharing a coffee and a good argument with students. 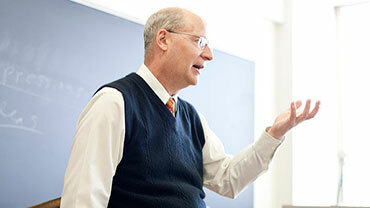 Philosophy at EIU offers superior education in a student-centered culture. We don't participate in teacher certification and we don't have a graduate program: we focus entirely on our undergraduate students, offering them an outstanding liberal arts experience. Our program participates heavily in General Education – this means that students can introduce themselves to Philosophy by taking a course that counts toward a General Education requirement. If they like the course, then there are many more Philosophy courses available! If not, the student has at least completed a course that counts toward graduation requirements. We encourage students to branch out and try something new and different! Click here for more on our program. Our students give us a lot to be proud of. Click here for some of their recent achievements. Transition times can be very difficult for students. What should I major in? What in the world will I do with a Philosophy degree? Philosophy at EIU loves to answer these questions! Major in something practical! Major in Philosophy! Critical thinking skills, problem-solving, organizational ability, and effective oral and written communication are important for professional success and signal the hallmarks of transferable skills offered by a Philosophy degree. Above, we concentrated on the achievements of those who chose to major in Philosophy. Click here to see some of our Philosophy majors at EIU who have had wonderful success at transitioning to the next step on their journey. 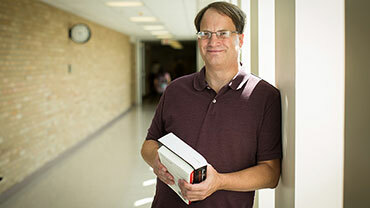 Dr. Grant Sterling is the 2014-2015 Faculty Laureate at EIU, an award that recognizes outstanding teaching, particularly in the general education curriculum. Dr. Sterling is the first member of the Philosophy faculty to receive the award. He was nominated by his department chair and supported by colleagues and students from many areas across campus. Professor Aylesworth specializes in contemporary continental philosophy.